Good product at a good price..delivered quickly. Ordered in the morning, shipped that afternoon. On my doorstep the next day. 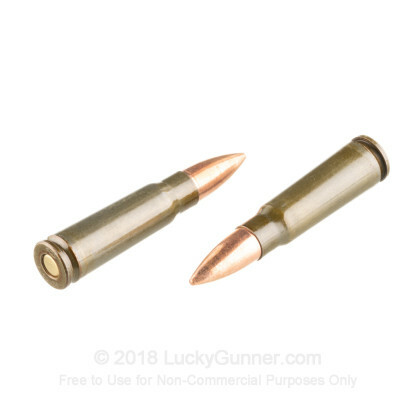 Affordable ammo with reasonable shipping. Great experience with Lucky Gunner. Shot around 150 rounds this weekend. No issues or problems. Will be back! I cycle a lot of 7.62 x 39 rounds through my AK-47 and the Brown Bear 123 gr has never failed me. Great ammo from a great company. Lucky got my order out right away before the door closed on the NY UNsafe Act. I really appreciated that. Their prices are very competitive too! . Was browsing around the web looking for some bulk ammo then found this and bought it for the cheapest price ive seen online ! this site is amazing and great customer service will always buy from lucky ! 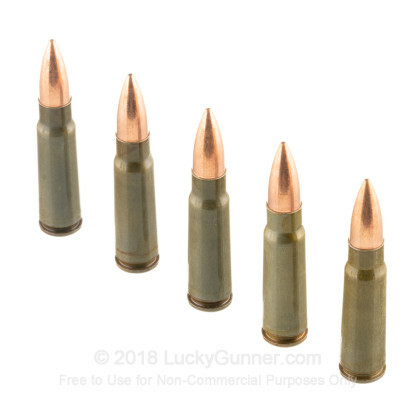 The ammo is the highest quality Russian ammo you can buy on the market no jams or FTFs this ammo works great for anyone with a Ak pattern rifle! The rounds performed as expected. I ran 500 rds through my rifle and both the rifle and rounds performed well. I did not experience any misfeeds or jams. This was my first purchase with LuckyGunner and I will definately become a repeat customer. I was definately pleased with the overall experience; both on the range as well as a customer. Ak ammo is not required to be top quality. this is the best bang for your buck. been shooting for 30 yrs never had one misfire or squib or jam cant beat for cheap fmj ammo for aks. Perfect for training. This ammo makes it affordable to shoot in my Ohio Ordinance VZ-2000 (VZ58 clone-American Made) No jams, failures to feed or extract. The Fiocci ammo I had had 1 failure to fire and 2 failure to feed. My local range is pretty picky on ammo I can use and they had no issue with this stuff. 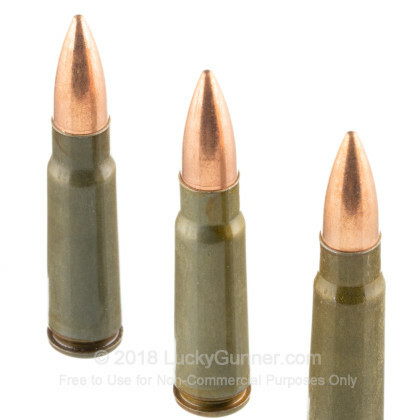 You can't beat $0.26 per round for 7.62x39 that my range allows. At the counter they sell the PMC brass stuff for $17 per box. 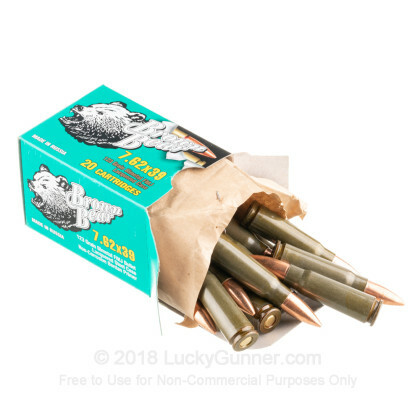 Good ammo over all and a great price and no jams. Had one issue with a primer braking off into my chamber that caused my one and only jam. From then on had a great time shooting this ammo that packs a good punch. I was splitting granite rocks the size of a football. Great price for large quantity. Q: I need to know what metal (or combination of metals) are used for the jacket of the bullet. The nearby outdoor range doesn't allow steel jackets and they test them with magnets. A: The metals used in these bullets are copper, steel, and lead. The bullet jacket is composed of a copper and steel bimetal material. This result will attract a magnet to the bullet. While some people claim the steel content will wear out the barrel sooner, this is simply not true. Additionally, all components in this ammo are non corrosive. 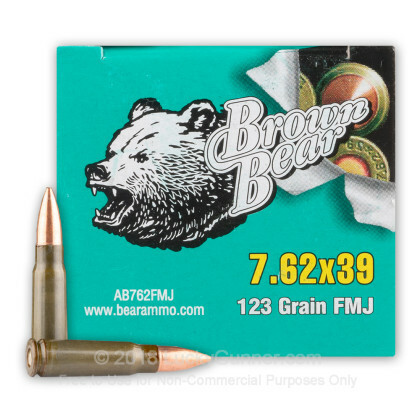 We also have this 7.62X39 - 123 gr FMJ - Brown Bear - 20 Rounds ammo in stock in a smaller quantity.